The Applet Loads But Displays the Message "unable to connect to our server"
A. If the applet does not load correctly then it would appear your current computer settings are not compatible with our real-time charting tool. If you do not have a compatible version of the Java software, when you try to run the applet you might (depending on the browser that you are using) be prompted to download the latest version of the Java™ Plug-in for your browser. If you are presented with a security warning similar to the one shown below, then click "Yes" and follow the on-screen instructions to install the plug-in. If you are not automatically prompted by your browser, you can also get the Java™ Plug-in by downloading and installing the J2SE Java™ Runtime Environment from the Java website. From the website, click on the yellow "Get It Now" button or click "Download" from the navigation menu, and then follow the on-screen instructions. The tool may also work with	other browsers, or with older versions of the above browsers. Depending on the browser you are using, you may need to configure it so that Java is enabled. Your network settings (e.g. a firewall, Proxy, etc.) may be preventing download of applets or downloading/streaming of data. If you are behind a firewall, it may need to be configured to allow java applets. Please check with your network administrator, or firewall supplier. If you are using internet security software, such as Norton Internet Security 2004, try turning off advert blocking. A. If you can see this message then the applet has detected that it is unable to connect to our data server, and therefore the charting tool cannot be used. The first thing you should try is to shut down all of your browser windows and then try to load the charting tool again. If you are still experiencing the same problem, then please see the suggestions below. There is a problem with your internet or network connection Please check that your internet and/or network connection is working. If it does not appear to be working then please contact your internet service provider or network administrator. When you run the tool for the first time, a security warning will appear (shown below). This is because the tool is a java applet signed with a security certificate that you must trust. By trusting the applet you are giving it the permissions it requires to be able to connect to our servers to collect data, and to be able to save charts on your hard disk. Click "Always" to always accept the certificate every time you run the charting tool. If you select this option then you will not see the security message on future visits, and the applet will be automatically trusted. Click "Yes" to accept the certificate only on this occasion. You will be prompted with the same security message the next time you load the tool. Click "No" to reject the certificate on this occasion. You will be prompted with the same security message the next time you load the tool. You can click on "More Details" to view further information about the certificate. Note: You must trust the applet if you want to use the tool. If you select	"No" then none of the tool's features will function. Important: Before you choose to trust the applet, please check that "The security certificate was issued by a company that it trusted" and "The security certificate has not expired and is still valid" are both displayed in the security warning (to ensure that the applet has not been tampered with). 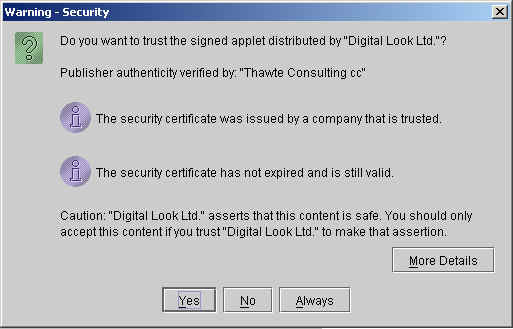 If you have tried all of the above suggestions and you are still receiving the same error then please contact info@digitallook.com. A. These things will happen if the applet is unable to retrieve data from our server. It is likely to be due to similar reasons to those described above. Click the pop-up blocker button on the toolbar to add this site to your whitelist. Note: This will cause the applet to be restarted. Press and hold the CTRL key each time you click on one of the links.